Manslaughter Category Archives — Boston Criminal Lawyers Blog Published by Massachusetts Criminal Defense Attorney — Law Offices of Lefteris K. Travayiakis, P.C. Richard Walling, 20, of Wareham, Massachusetts, was arrested on Murder Charges in connection with the stabbing deaths of Leonard Bollla, 35, adn Ryan Aponte, 24, both of Wareham, which occurred at a Wareham motel. Walling is expected to be arraigned tomorrow morning on two counts of Manslaughter. According to the Plymouth County District Attorney’s Office, Bolla and Aponte were both stabbed at a Wareham motel Friday evening. Although few details have been released to date, it has been reported that the murders resulted from a botched robbery attempt, wherein two masked men broke into the front door of the motel and tried the motel owner’s daughter and boyfriend, who is Richard Walling. Apparently Walling tried to fight off the two men, Bolla and Aponte, after a scuffle, ended up stabbing both of them. Fernando Aristy, 24, of Chelsea, Massachusetts, continues to be held without bail in connection with the Murder of Chad McDonald, Sr., which allegedly resulted from a confrontation between the two at a Lynn warehouse. Aristy is charged with First Degree Murder, Aggravated Assault & Battery with a Dangerous Weapon and Aggravated Assault & Battery (both counts being ‘aggravated’ as a result of serious bodily injuries). According to the Essex County District Attorney’s Office, Aristy hit McDonald in the face and head with his fists as well as with a 2×4 piece of wood. McDonald was initially hospitalized for eleven days, but later succumbed to his injuries. Edward Washington, 31, of Boston, Massachusetts, was arrested and is to be charged in connection to the Mattapan murders that claimed the lives of four people during the September drug robbery in Mattapan. Boston Police reported that Washington is to be charged with four counts of Murder, as well as Armed Assault with Intent to Murder, Home Invasion, Armed Robbery, and Unlawful Possession of a Firearm. He is scheduled to be arraigned this morning in the Dorchester Division of the Boston Municipal Court. As previously reported in the Boston Criminal Lawyers Blog, the Boston Police and Suffolk County prosecutors allege that Edward Washington, Dwayne Moore and Kimani Washington conspired to rob Simba Martin, who was known to them as dealing drugs from his Mattapan home on Sutton Avenue. The men, according to the Boston Police and prosecutors, knew that Martin ran a drug business from his home and knew of his stash of drugs and money. Mary Huot, of Fall River, Massachusetts, is charged with Assault with Intent to Murder for allegedly driving her car into a large crowd of people. The incident occurred last Sunday morning when Huot allegedly drove into the crowd, which resulted in injuries to three young women. According to New Bedford Police, a witness told them Huot laughed as she drove her car over the curb and gunned the gas at several people standing on the grass. Huot then allegedly left the scene of the incident. In addition to Assault with Intent to Murder charges, Huot was also charged with Leaving the Scene of an Accident with Personal Injury, and Assault & Battery with a Dangerous Weapon. She is expected back in court this Monday for a Dangerousness Hearing. 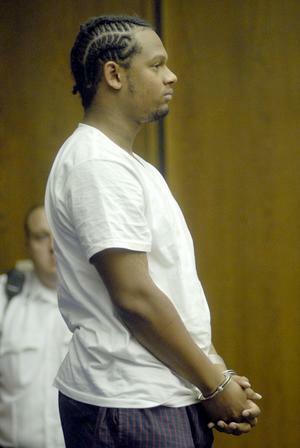 Sherrod Bright, 26, was sentenced to 10 years in connection to the 2006 Murder of Corey Davis of Cambridge, Massachusetts. In a plea deal, Bright pled Guilty to Manslaughter, being sentenced to 10 years in state prison, followed by 10 years probation upon his release. According to the Cambridge Police Department and the Middlesex County District Attorney’s Office, on March 19, 2006, Cambridge Police were called to investigate a shooting on Hamilton Street in Cambridge. Once on scene, officers found Davis lying on the sidewalk suffering from multiple gunshot wounds. In addition to Sherrod Bright, his brother, Ahmad Bright, 17 of Dorchester, was indicted by a Middlesex County Grand Jury on Second Degree Murder Charges and Unlawful Possession of a Firearm; and Remel Ahart, 21 of Cambridge, was also charged with First Degree Murder, Armed Assault to Murder, and two counts of Unlawful Possession of a Firearm. Cambridge Police allege that Ahart shot Davis from the backseat of a car near where his body was found, and that Bright participated in the shooting as a Joint Venturer. Both Ahmad Bright and Remel Ahart have been previously found guilty of these charges. Hector Guardiola, 25, of South Boston, Massachusetts, was arraigned today in Roxbury District Court on charges of Manslaughter and Assault & Battery with a Dangerous Weapon in connection with an incident at a Lansdowne Street pub that resulted in the death of Michael DiMaria. DiMaria, who lived in New York, was in Boston visiting with old friends from college and the group went to a pub on Lansdowne Street to spend some time together. According to the Suffolk County District Attorney’s Office, prosecutors allege that a trivial argument broke out at the pub because one of the men in DiMaria’s group accidentally brushed against Guardiola as he was going to the bathroom. An argument allegedly ensued and DiMaria’s friend walked back to the table. At that point, Guardiola allegedly threw a beer mug, which shattered after hitting something and shards of sharp glass struck DiMaria, cutting his jugular vein. Lakeisha Gordon is currently on trial for Manslaughter in connection with the shooting death of her 8 year old son, Liquarry Jefferson, in 2007. Gordon and her older son, Jayquan McConnico, were both charged in the boy’s death for unlawful storage of an unlicensed firearm within reach of a young child. Although McConnico was also charged, he pled guilty to similar charges in 2008. Liquarry Jefferson was fatally shot in the home by another boy, who was 7 years old at the time. At trial today, the boy, now 10, testified that he was watching TV when Liquarry Jefferson showed him the gun, which belonged to Jayquan McConnico. The boy testified that he asked Jefferson if there were bullets in the gun, and Jefferson said no. At that point, the boy testified he accidentally shot Jefferson.